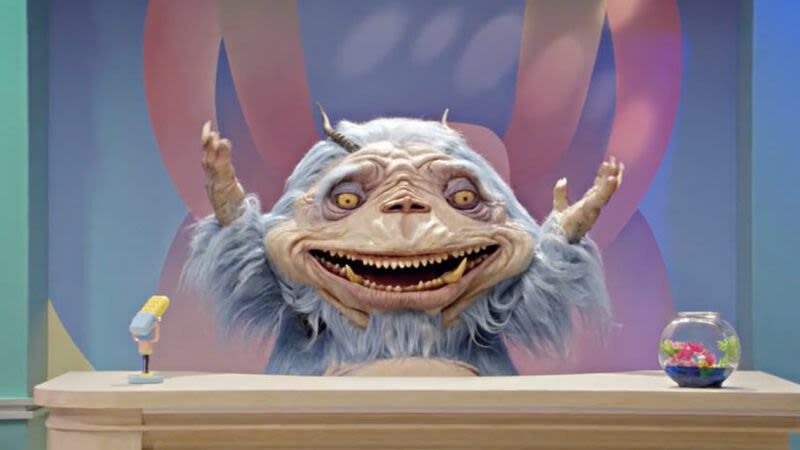 According to The Hollywood Reporter, Comedy Central has decided to cancel The Gorburger Show, a satirical talk show starring T.J. Miller as a big space monster trying to learn about humanity. It ran for only eight episodes earlier this year, following a couple of seasons on Funny Or Die. THR doesn’t say anything about ratings, but considering that The Gorburger Show had that premise, focused on that horrible thing you see up above, and only ran for eight episodes, it seems safe to assume that it wasn’t lighting up the charts. Of course, this news also comes just hours after The Daily Beast published a graphic story in which a woman accused T.J. Miller of physically and sexually assaulting her when they were students at George Washington University together in the early ‘00s. Comedy Central claims the decision not to continue the show “pre-dated the allegations,” but the timing of this announcement probably isn’t a coincidence.